Gemstones have spiritual qualities that can be transferred to an individual who possesses them. In Jewish culture 12 gems could be found on the breastplate of the high priest. Each stone represented one of the 12 tribes of Israel. In early Christianity gemstones were associated with the 12 apostles of Christ. In the Book of Revelations twelve stones are once again mentioned as the foundation stones of the wall of New Jerusalem. The lore surrounding gemstones has spread to all magickal traditions; Egyptian, Greek, Roman and Germanic cultures. Each culture have their own viewpoint about how gemstones and how they related to heavenly and earthly matters. 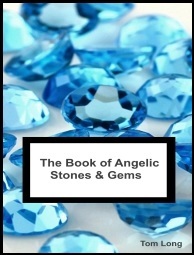 This Informational eBooklet deals entirely with the gemstones of the archangels. It details the correct stones for each archangel, how they are concecrated and charged with angelic power. Their use in ritual and how they may be used for self-protection against negative vibrations. The wisest men on Earth were the Brahmins. Who gave Appollonius seven rings, telling him to wear each rings, in which was set a stone of each of the planets, and that he should wear them in turn on the appropriate day of the week. These rings are also addressed. A simple eBooklet, but one you may wish to add to your collection.